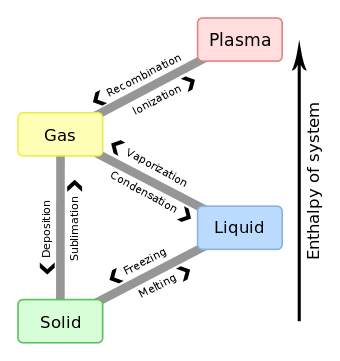 In thermodynamics, the vapor–liquid equilibrium describes the distribution of a chemical species between the gas phase and a liquid phase. The concentration of a vapor in contact with its liquid, especially at equilibrium, is often expressed in terms of vapor pressure, which will be a partial pressure (a part of the total gas pressure) if any other gas(es) are present with the vapor. The equilibrium vapor pressure of a liquid is in general strongly dependent on temperature. At vapor–liquid equilibrium, a liquid with individual components in certain concentrations will have an equilibrium vapor in which the concentrations or partial pressures of the vapor components have certain values depending on all of the liquid component concentrations and the temperature. The converse is also true: if a vapor with components at certain concentrations or partial pressures is in vapor–liquid equilibrium with its liquid, then the component concentrations in the liquid will be determined dependent on the vapor concentrations and on the temperature. The equilibrium concentration of each component in the liquid phase is often different from its concentration (or vapor pressure) in the vapor phase, but there is a relationship. The VLE concentration data can be determined experimentally, or computed or approximated with the help of theories such as Raoult's law, Dalton's law, and Henry's law. Such VLE information is useful in designing columns for distillation, especially fractional distillation, which is a particular specialty of chemical engineers. Distillation is a process used to separate or partially separate components in a mixture by boiling (vaporization) followed by condensation. Distillation takes advantage of differences in concentrations of components in the liquid and vapor phases. In mixtures containing two or more components, the concentrations of each component are often expressed as mole fractions. The mole fraction of a given component of a mixture in a particular phase (either the vapor or the liquid phase) is the number of moles of that component in that phase divided by the total number of moles of all components in that phase. Binary mixtures are those having two components. Three-component mixtures are called ternary mixtures. There can be VLE data for mixtures with even more components, but such data is often hard to show graphically. VLE data is a function of the total pressure, such as 1 atm or whatever pressure the process is conducted at. When a temperature is reached such that the sum of the equilibrium vapor pressures of the liquid components becomes equal to the total pressure of the system (it is otherwise smaller), then vapor bubbles generated from the liquid begin to displace the gas that was maintaining the overall pressure, and the mixture is said to boil. This temperature is called the boiling point of the liquid mixture at the given pressure. (It is assumed that the total pressure is held steady by adjusting the total volume of the system to accommodate the specific volume changes that accompany boiling.) The boiling point at an overall pressure of 1 atm is called the normal boiling point of the liquid mixture. The field of thermodynamics describes when vapor–liquid equilibrium is possible, and its properties. Much of the analysis depends on whether the vapor and liquid consist of a single component, or if they are mixtures. where and are the pressures within the liquid and vapor, and are the temperatures within the liquid and vapor, and and are the molar Gibbs free energies (units of energy per amount of substance) within the liquid and vapor, respectively. In other words, the temperature, pressure and molar Gibbs free energy are the same between the two phases when they are at equilibrium. where and are the fugacities of the liquid and vapor, respectively, at the system temperature Ts and pressure Ps. Using fugacity is often more convenient for calculation, given that the fugacity of the liquid is, to a good approximation, pressure-independent, and it is often convenient to use the quantity , the dimensionless fugacity coefficient, which is 1 for an ideal gas. where G is the (extensive) Gibbs free energy, and ni is the amount of substance of component i. The preceding equilibrium equations are typically applied for each phase (liquid or vapor) individually, but the result can be plotted in a single diagram. 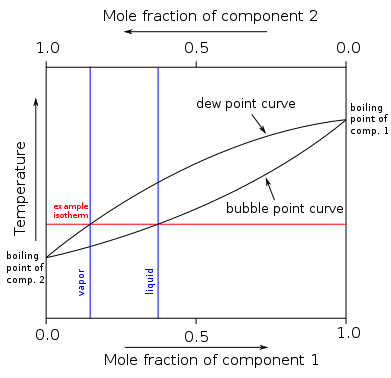 In a binary boiling-point diagram, temperature (T ) is graphed vs. x1. At any given temperature where both phases are present, vapor with a certain mole fraction is in equilibrium with liquid with a certain mole fraction. The two mole fractions often differ. These vapor and liquid mole fractions are represented by two points on the same horizontal isotherm (constant T ) line. When an entire range of temperatures vs. vapor and liquid mole fractions is graphed, two (usually curved) lines result. The lower one, representing the mole fraction of the boiling liquid at various temperatures, is called the bubble point curve. The upper one, representing the mole fraction of the vapor at various temperatures, is called the dew point curve. These two curves necessarily meet where the mixture becomes purely one component, namely where x1 = 0 (and x2 = 1, pure component 2) or x1 = 1 (and x2 = 0, pure component 1). The temperatures at those two points correspond to the boiling points of each of the two pure components. For certain pairs of substances, the two curves also coincide at some point strictly between x1 = 0 and x1 = 1. When they meet, they meet tangently; the dew-point temperature always lies above the boiling-point temperature for a given composition when they are not equal. The meeting point is called an azeotrope for that particular pair of substances. It is characterized by an azeotrope temperature and an azeotropic composition, often expressed as a mole fraction. There can be maximum-boiling azeotropes, where the azeotrope temperature is at a maximum in the boiling curves, or minimum-boiling azeotropes, where the azeotrope temperature is at a minimum in the boiling curves. If one wants to represent a VLE data for a three-component mixture as a boiling point "diagram", a three-dimensional graph can be used. Two of the dimensions would be used to represent the composition mole fractions, and the third dimension would be the temperature. Using two dimensions, the composition can be represented as an equilateral triangle in which each corner represents one of the pure components. The edges of the triangle represent a mixture of the two components at each end of the edge. Any point inside the triangle represents the composition of a mixture of all three components. The mole fraction of each component would correspond to where a point lies along a line starting at that component's corner and perpendicular to the opposite edge. The bubble point and dew point data would become curved surfaces inside a triangular prism, which connect the three boiling points on the vertical temperature "axes". Each face of this triangular prism would represent a two-dimensional boiling-point diagram for the corresponding binary mixture. Due to their three-dimensional complexity, such boiling-point diagrams are rarely seen. Alternatively, the three-dimensional curved surfaces can be represented on a two-dimensional graph by the use of curved isotherm lines at graduated intervals, similar to iso-altitude lines on a map. Two sets of such isotherm lines are needed on such a two-dimensional graph: one set for the bubble point surface and another set for the dew point surface. where yi and xi are the mole fractions of component i in the phases y and x respectively. The values of the ratio Ki are correlated empirically or theoretically in terms of temperature, pressure and phase compositions in the form of equations, tables or graph such as the DePriester charts (Shown on the right). which is a measure of the relative ease or difficulty of separating the two components. Large-scale industrial distillation is rarely undertaken if the relative volatility is less than 1.05 with the volatile component being i and the less volatile component being j.
K values are widely used in the design calculations of continuous distillation columns for distilling multicomponent mixtures. At boiling and higher temperatures the sum of the individual component partial pressures becomes equal to the overall pressure, which can symbolized as Ptot. y1 = P1 / Ptot, y2 = P2 / Ptot, ... etc. where P1 = partial pressure of component 1, P2 = partial pressure of component 2, etc. P1 = x1 P o1, P2 = x2 P o2, ... etc. where P o1, P o2, etc. are the vapor pressures of components 1, 2, etc. when they are pure, and x1, x2, etc. are mole fractions of the corresponding component in the liquid. P1T = x1 P o1T, P2T = x2 P o2T, ... etc. Ptot = x1 P o1T + x2 P o2T + ... etc. At a given Ptot such as 1 atm and a given liquid composition, T can be solved for to give the liquid mixture's boiling point or bubble point, although the solution for T may not be mathematically analytical (i.e., may require a numerical solution or approximation). For a binary mixture at a given Ptot, the bubble point T can become a function of x1 (or x2) and this function can be shown on a two-dimensional graph like a binary boiling point diagram. y1 = x1 P o1T / Ptot, y2 = x2 P o2T / Ptot, ... etc. Once the bubble point T's as a function of liquid composition in terms of mole fractions have been determined, these values can be inserted into the above equations to obtain corresponding vapor compositions in terms of mole fractions. When this is finished over a complete range of liquid mole fractions and their corresponding temperatures, one effectively obtains a temperature T function of vapor composition mole fractions. This function effectively acts as the dew point T function of vapor composition. 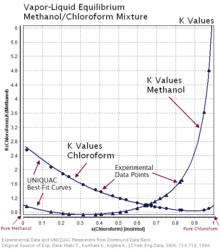 For many kinds of mixtures, particularly where there is interaction between components beyond simply the effects of dilution, Raoult's law does not work well for determining the shapes of the curves in the boiling point or VLE diagrams. Even in such mixtures, there are usually still differences in the vapor and liquid equilibrium concentrations at most points, and distillation is often still useful for separating components at least partially. For such mixtures, empirical data is typically used in determining such boiling point and VLE diagrams. Chemical engineers have done a significant amount of research trying to develop equations for correlating and/or predicting VLE data for various kinds of mixtures which do not obey Raoult's law well. George Schlowsky, Alan Erickson, and Thomas A. Schafer, Modular Process Systems, Inc., Operations & Maintenance - Generating your own VLE Data, Chemical Engineering, March 1995, McGraw-Hill, Inc.
1 2 3 Kister, Henry Z. (1992). Distillation Design (1st ed.). McGraw-hill. ISBN 0-07-034909-6. 1 2 3 4 Perry, R.H.; Green, D.W., eds. (1997). Perry's Chemical Engineers' Handbook (7th ed.). McGraw-hill. ISBN 0-07-049841-5. ↑ Seader, J. D. & Henley, Ernest J. (1998). Separation Process Principles. New York: Wiley. ISBN 0-471-58626-9. ↑ Balzhiser et al. (1972), Chemical Engineering Thermodynamics, p. 215. ↑ Balzhiser et al. (1972), Chemical Engineering Thermodynamics, p. 216. ↑ Balzhiser et al. (1972), Chemical Engineering Thermodynamics, p. 218.